This exclusive session starts with an introduction into bees and bee-keeping with Sergio, bee-keeper at Albury. Learn about the equipment and tools used by bee-keepers, and get a glimpse inside one of our Albury hives. You'll be suited up as a bee-keeper yourself, and so able to handle the frames and enjoy a close-up view of the busy workers. 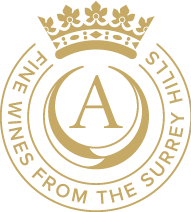 After your demonstration, you'll return to the vineyard barn for a question and answer session with Sergio whilst enjoying a glass of our award-winning sparkling wine, plus the chance to taste and buy our Albury Honey and Surrey Hills Mead. All sessions start at 10am and last between 2 and 2.5 hours. Want to get more involved with the bees? Maybe you've thought of getting your own hives? You might be interested in our Bee Club!